Many of our friends and neighbors are now parents of teenage drivers, so we thought it would be a great idea to offer a free seminar to teach young people some car care basics. We had a great turn out for our first seminar. Mike started with a talk about the importance of oil in your car and what happens to the engine when you drive without oil. (Watch the video here.) The lesson? If you’ve got an oil leak and don’t at least add oil periodically, your engine can overheat, damaging the valves and pistons. A new engine can cost $5000. 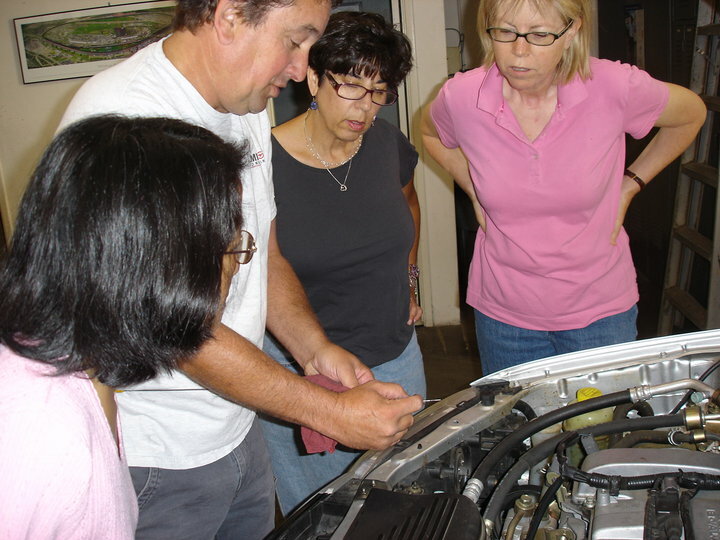 Become a fan of Helming’s Auto Repair on Facebook and stay informed about our next seminar. It’s a wonderful service you provided for the kids! [Our daughter] was very proud of the tire changing business and seems more comfortable with the idea of dealing with a car problem. Barbara D.
Thanks so much for the car class. [Our son] enjoyed it and feels more confident about his ability to maintain his car. And we feel more confident that he could change a tire if he needed to. Since he’s not too far from being out on the road on his own, we can use all the confidence we can get. Julie S.
Thank you for holding this seminar for the kids. [Our daughter] learned a lot and enjoyed getting this important information. Margo K.